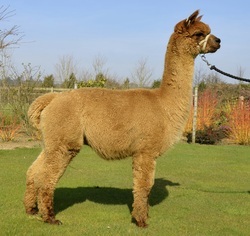 The oldest of our 2013 import from Snowmass Alpacas, Golden Legend impresses from the moment first seen. Wonderfully representative of the Huacaya phenotype he stands out amongst his peers with his regal attitude. He has tremendous body capacity carried on a strong frame, and with his astonishing substance of bone he looks the part. Move to his fleece and the picture is complete, dense, fine, soft handling, uniform in micron, and with good staple length this 7 year old male vindicates our decision to import him just on his own merits. 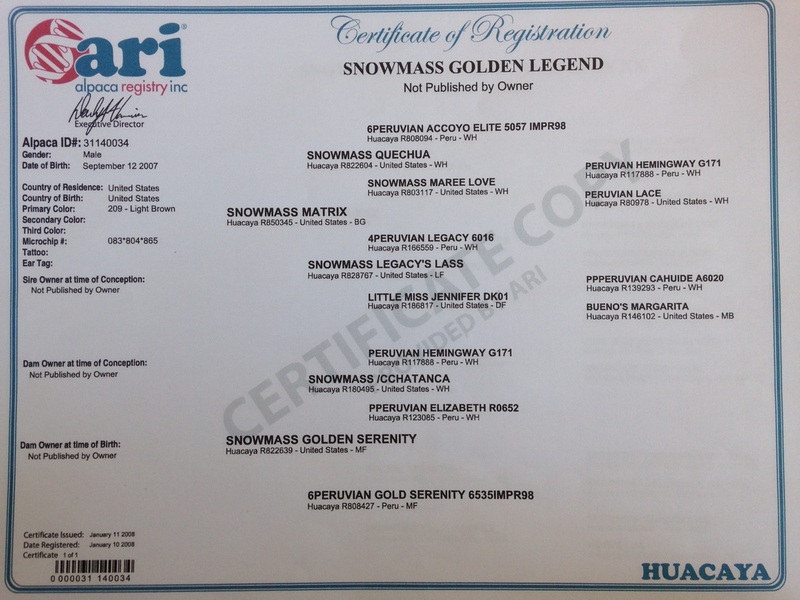 Look at his pedigree and you see Snowmass Matrix (the worlds highest priced male 675,000 dollars) amongst others giving a depth to the pedigree that will be hard to beat. On his own he is hard to ignore, with his pedigree he is irresistible. The very reason he has been used heavily in our own coloured breeding programme in his first year with us. Some things are inevitable, we believe the quality of his cria will be one of those “things”.